Performance of 20th century vocal, electronic and chamber music at WBAI's Free Music Store on April 14, 1972. WBAI's Barbara Oka introduces the program. Part 1 of this recording begins with electronic music by Venezuelan composer Alfredo del Monaco. The American Vocal Quintet, consisting of Marshall Thomas, baritone, Yoshi Ito, soprano, Joyce Gerber, alto, Sidney Johnson, tenor, and Kenneth Bell, bass, perform About the maypole by Thomas Morley; Madonna, non so dir tante parole by Philippe Verdelot; O vin en vigne by Orlando Lassus; Geographic fugue by Ernst Toch; and Foggy day by George Gershwin, arranged by Tom Wagner. The Halas Woodwind Quintet, consisting of Peggy Schecter, flute, Henry Schuman, oboe, Kenneth Adams, clarinet, William Hamilton, French horn, and Donald McCourt, bassoon, performs Sextet for piano, flute, oboe, clarinet, bassoon and horn by Francis Poulenc (with Etsuko Tazaki, piano). 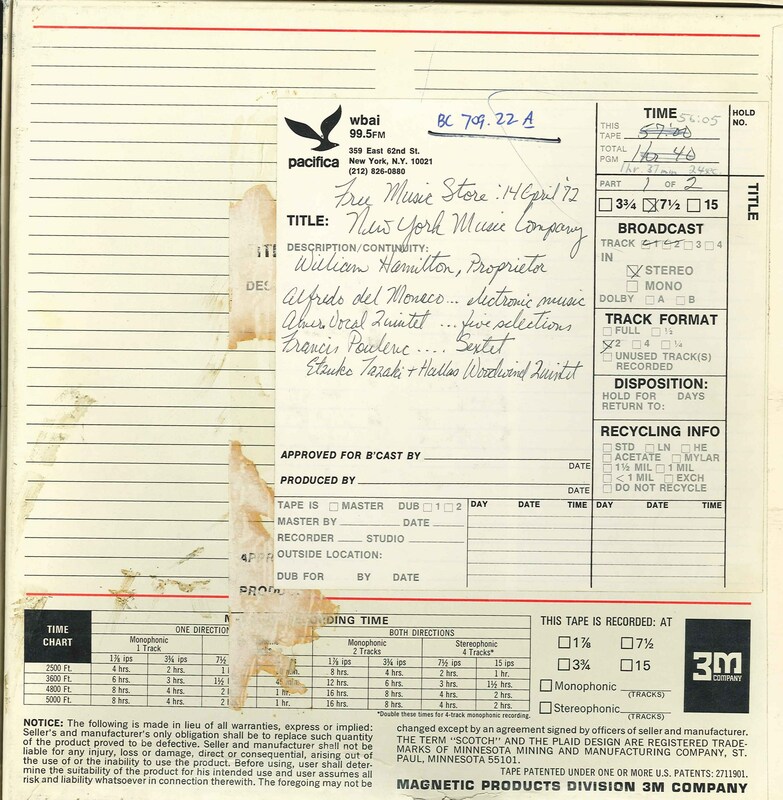 Recorded in stereo and produced by William A. Hamilton and WBAI's Music Department. This recording was formerly cataloged as BC0709.22A. 2 reels (98 min.) : 7 1/2 ips, mono.